Jasmine mask is from Gypsy Renaissance's Sequins & Sparkles mask collection. 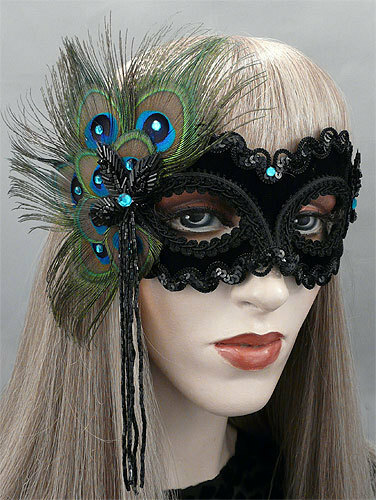 Jasmine is a black masquerade mask with peacock eyes, black trim, and rhinestones. Jasmine is covered with black velvet fabric and decorated with black braiding and sequin trim. Mask is adorned with a semi-circle of peacock eyes and embellished with black glass beaded leaves and dangles. Mask is finished with aquamarine rhinestones.